While France gets ready to play Croatia in the World Cup final on Sunday, France’s Antoine Labat is happy for his country but is more focused on another competition. The lone Frenchman standing in the 2018 WSOP Main Event, Labat says he feels the support from his home country. A mostly online player, using the monicker 'Mpiyavv' to collect $623,363 in earnings, Labat has just under $200,000 in live cashes to his credit. His only two WSOP cashes, both coming from this summer, make for a total of $6,857 prior to the Main. Really into all kinds of board games and competitive chess growing up, Labat naturally transitioned into poker as soon as he could, around age 17. Once he could go to casinos at 18, he did so, and pretty soon Labat was playing live cash and online MTTs for a living, which he does to this day. That's exactly what he did in the final hand of the night, even though it didn't work out this time. The monster cooler of a last hand of the evening saw Labat commit most of his stack with pocket kings, only to be up against Nicolas Manion’s pocket aces and another pair of kings, held by the shorter-stacked Yueqi Zhu. 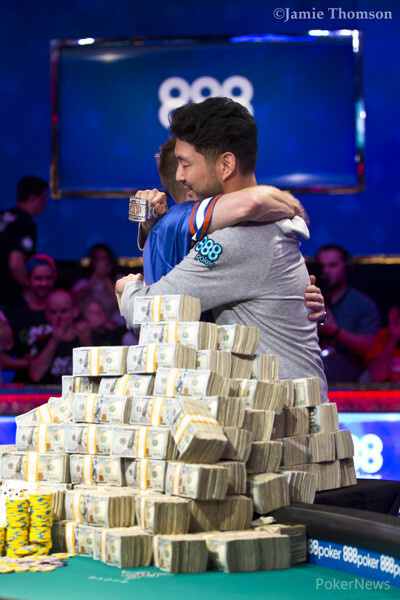 Manion’s aces held up and, while Zhu’s elimination got them down to the official final table, Labat was left as the short stack. 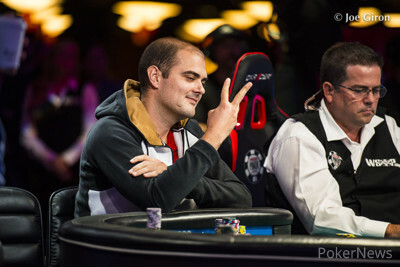 Understandably, Labat was feeling a bit sad right after bagging up for the final table, but the feelings were mixed. But even though it didn't go down exactly the way he'd hoped, Labat stayed positive and kept perspective. On Day 6, Labat caught a massive heater to soar from 2.015 million to a third-place stack of 28.445 million to end the day. He caught fire with that pot, flopping a boat with jack-nine against Jeff Trudeau, and then going runner-runner Broadway against Andres Jeckeln, who had flopped a set of fives. A bit later, Labat flopped a set of queens when Jeckeln flopped another set of fives, and Labat won that significant pot which put him into the chip lead for the first time. With players dropping on Day 7, Labat was feeling the pressure and was focusing on his breathing, making sure the oxygen was getting to his body and brain. His goals as the final tabled approached? It’s fun for Labat to be playing at the WSOP final table after watching it with his brother on TV in France a decade ago. His friends and family in France likely stayed up all night watching Labat make the final table, and his sister is also flying in but will be late. Again, Labat hopes he can build up his stack and stick around, so they get to watch him play. While Labat was disappointed to take the big hit at the end of the night and come into the final table short, he is confident that he will find a double up and build back. The 2018 World Series of Poker Main Event Final Table Starts at 5:30 p.m.